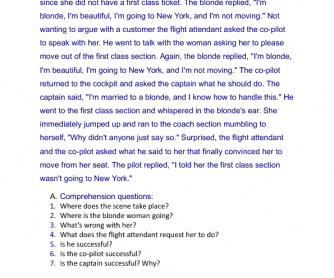 This worksheet is about a joke about a blonde woman travelling to New York. Students are required to answer questions to check their undertanding of the joke, then they can role play the scene in groups of 4 people. Works well after a lesson on reported speech. Teachers can also use this as an opportunity to talk about stereotypes. Is the joke really funny or is it based on outdated stereotypes about women/blondes? Joke - Adverb or Adjective?